Mardis Gras Party Cake won the 11th Pillsbury Bake-Off in 1959. Recipe on Pillsbury.com by Eunice G. Surles of Lake Charles, Louisiana. 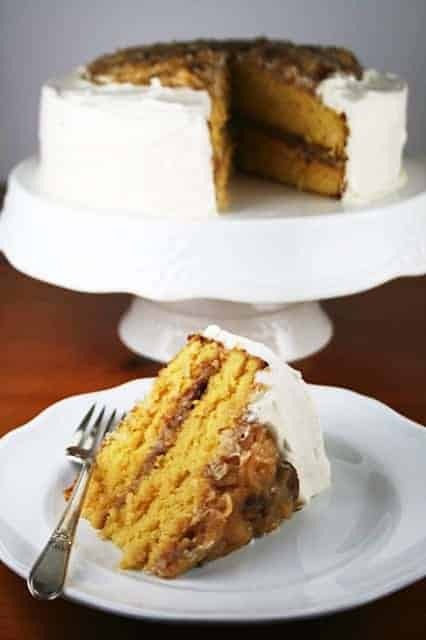 What’s unique about this cake is the first ingredient – butterscotch chips. 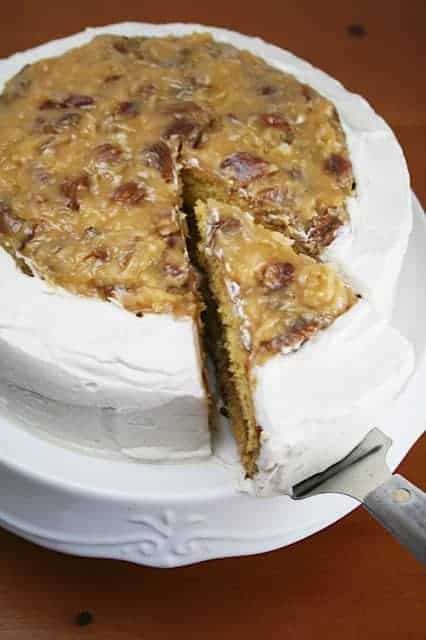 Have you ever had or heard of a butterscotch flavored cake? It’s a new cake flavor for me and very good. So the first step is to melt butterscotch chips with water. 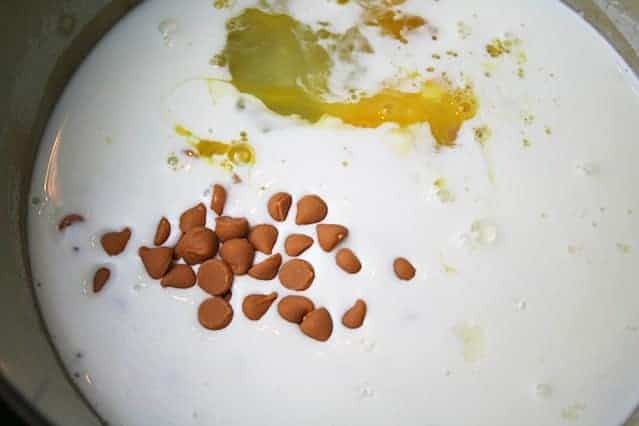 To make the batter, combine flour, sugar, baking soda, salt, baking powder, buttermilk, shortening, eggs and cooled butterscotch mixture. I actually just dumped all of these ingredients in the bowl and turned the mixer on (low speed until moistened and 3 minutes on medium). None of that creaming the butter and gradually adding this and that. Pour batter into prepared pans (I like to use cooking spray and parchment rounds). Bake for 20-30 minutes on 350°. Then you make the filling which is sugar, cornstarch, half-n-half, water, butterscotch chips and 1 egg. Cook over medium heat, stirring constantly, until thickened. Remove from heat. 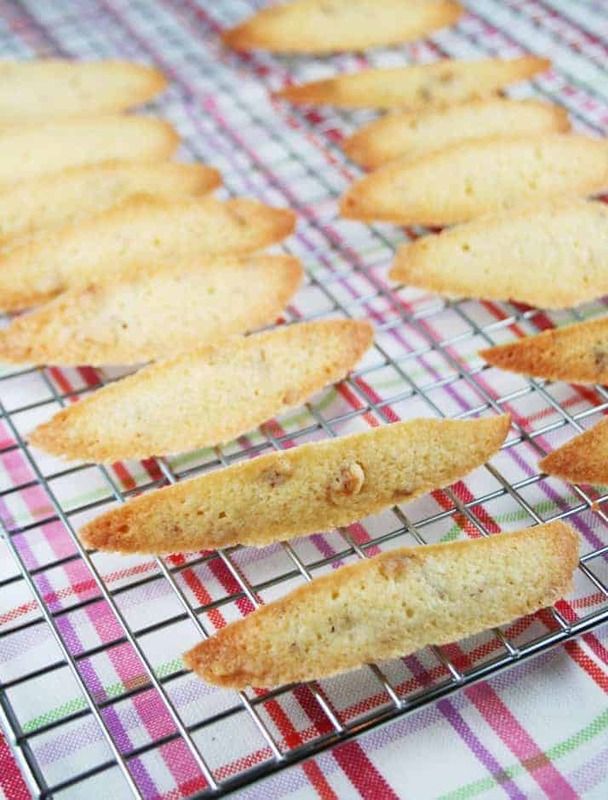 Stir in margarine, coconut and nuts. 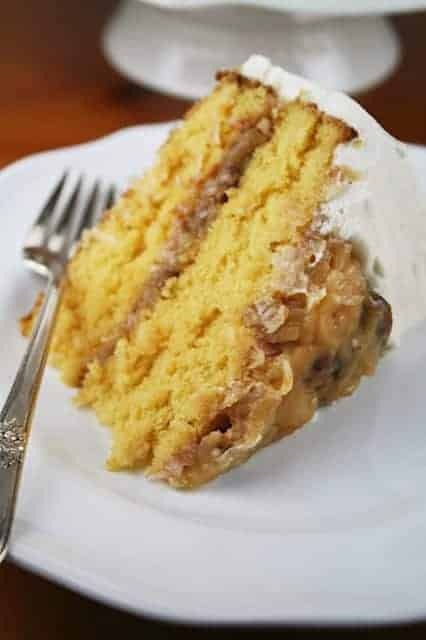 Spread half of the filling on one layer of cake. Top with second layer and spread the remaining filling, leaving a 1 inch border of cake all around. For the frosting, whip up some heavy whipping cream with brown sugar and vanilla. Frost the sides and top edge of cake. The consistency of the cake itself is very light and airy which is surprising to me since I just “dumped” all the ingredients in the bowl and mixed. Cakes are usually more complicated than that and so fussy. This was no fuss. Sweet! 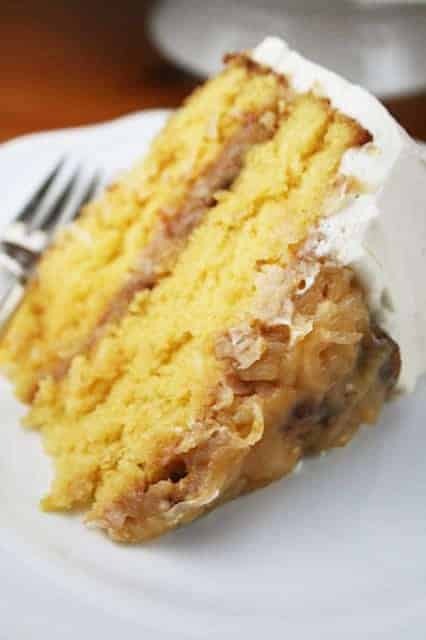 The filling reminds me of a german chocolate cake filling with a hint of butterscotch. The whipped cream frosting is a nice addition. It keeps the cake from being too rich. Heat oven to 350°F. Generously grease and flour two 9-inch round cake pans. 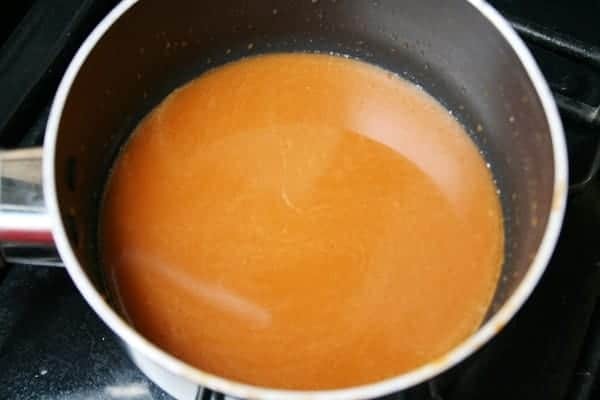 In small saucepan over low heat, melt 2/3 cup butterscotch chips in 1/4 cup water, stirring until smooth. Cool slightly. Bake at 350°F. for 20-30 minutes or until toothpick inserted in center comes out clean. Cool 10 minutes; remove from pans. Cool 30 minutes or until completely cooled. In medium saucepan, combine 1/2 cup sugar and cornstarch; stir half-and-half, 1/3 cup water, 1/3 cup butterscotch chips and 1 egg. Cook over medium heat until mixture thickens, stirring constantly. Remove from heat. Sitr in margarine, coconut and nuts; cool slightly. To assemble cake, place 1 cake layer, top side down, on serving plate. 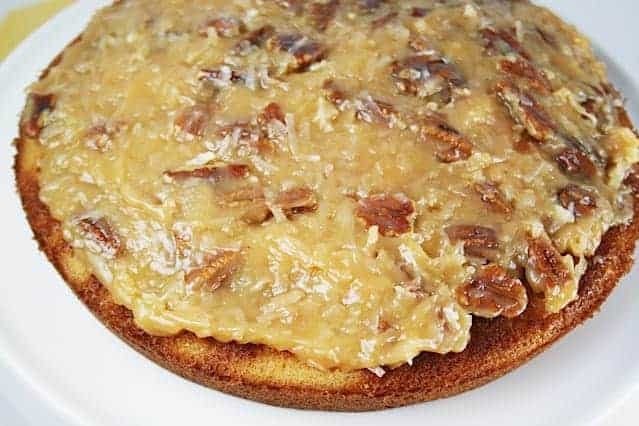 Spread with half of filling mixture. Top with second layer, top side up; spread remaining filling on top to within 1/2 inch edge. Frost sides and top edge of cake with seafoam cream. Refrigerate at least 1 hour before serving. Store in refrigerator.